There is a standardised way to monitor E1/T1 links. It is defined in ITU-T G.772 and is formally called a "Protected Monitoring Point". A correctly installed protected monitor point doesn't disturb the live link. This blog entry is about what happens if you install a monitor point incorrectly. An unterminated line, for instance by inadvertently leaving a cable unplugged. 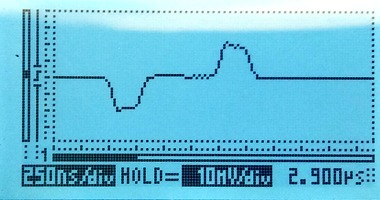 Unintentional transmission, for instance if the monitoring line is accidentally connected to another transmission line, or if monitoring equipment is accidentally mis-configured to transmit. There's an important note on the schematic: "max 1m" cable from the tap-in point to the resistors in the monitor point. The shorter the distance from the tap-in point to the resistors, the better. In many cases, it's possible to mount the resistors just a few millimetres from the tap-in point. To demonstrate what happens to an E1 signal, we created a live link in our lab, with connections just like in an operator's network. We've used a 1m long cable, the maximum allowed, from the tap-in point to the resistors. 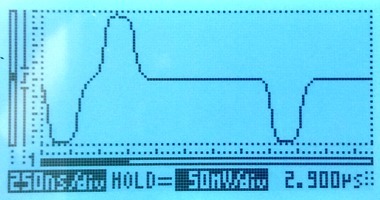 We then looked at the signal using a low-cost handheld oscilloscope. The chassis at the top of the photo is a Corelatus Messenger 2.1 with three modules in it. Messenger is normally used as an active part of an E1 network, e.g. to implement a voicemail system. We're only using the center module, which has two ethernet ports and eight E1/T1 ports. The green cable is the ethernet cable used to control the system. The yellow line is the live E1 link. It goes from port 'pcm1A' to a break-out box with punch blocks and then on to port 'pcm2A'. We can measure the number of bit errors on the live link. The punch blocks are the same as the ones operators have mounted in racks in their distribution frames. The red line taps in to the live E1 link at the punch blocks. The length of this red line is critical: if it's too long then signal reflections from the 540 ohm resistors at the end of the red line will disturb the live link. Corelatus specifies a maximum length of 1m for this red line, in the above example we've used two 0.5m cables. In examples further down the page, we'll increase that to see how bad things can get. 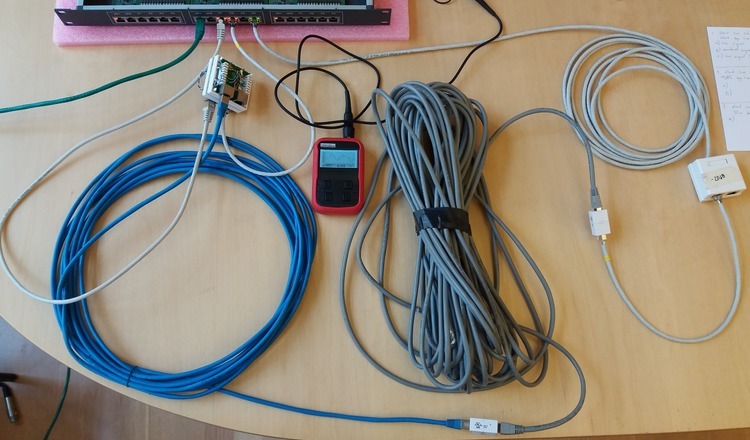 The red line leads to a box containing the monitoring resistors and then a 5m long cable back to the Messenger 2.1, where we've configured the incoming port to expect an attenuated signal. The length of the cable from the resistors to the monitoring equipment is not critical, it can be up to 200m. Here's what the signals on this setup look like. 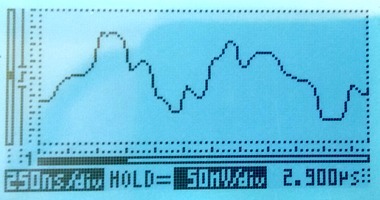 On the left, the live signal and on the right the monitored signal, which is attenuated by 20dB. Both signals are clean and have the expected shape. The scope indicates the scale on-screen; the horizontal (time) scale on both is the same, the vertical scales are different. 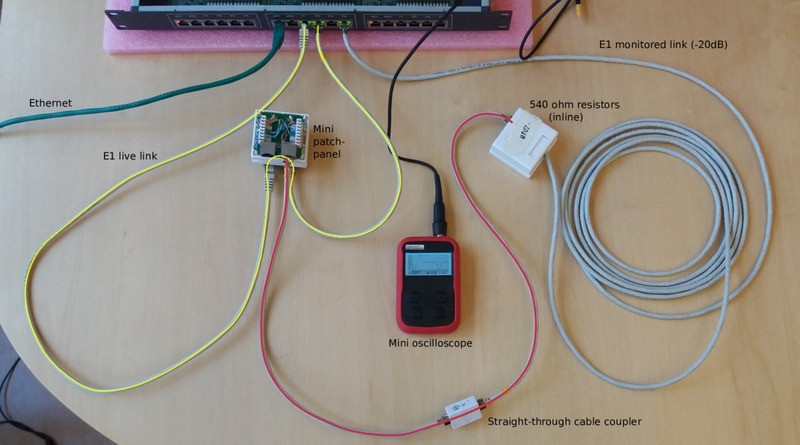 We're measuring through an x10 oscilloscope probe in all cases. The proper way to measure balanced E1 signals in the lab is with a two-channel oscilloscope, with one probe on each of the E1's conductors. 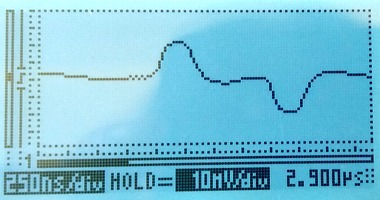 The scope can then display the result in differential, i.e. A-B, mode, with no risk of accidentally grounding one side of the E1. 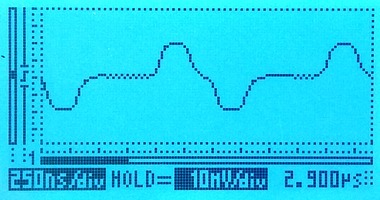 Since the Vellemann oscilloscope only has one channel, there's no A-B mode. So we have no choice but to connect the probe's "ground" to one conductor and the probe's tip to the other. This works fine, and there are no concerns about grounding since the scope is normally battery powered. 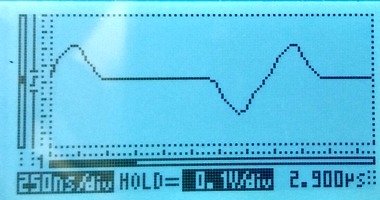 The Velleman oscilloscope is cheap and this was the first time we used it, so we checked the measurements using a high quality analog oscilloscope, a Tektronix 2445. The measurements agree well.